If you haven’t tried our “Family Fun with French” story time at the Central library this would be a great week to start! 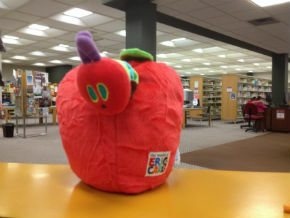 This week, Miss Kate is preparing a themed story time featuring Eric Carle’s The Very Hungry Caterpillar or, en français, La chenille qui fait des trous that includes puppets and images of real cocoons. The classic story is a great way to teach vocabulary and learn a about nature. WPL’s bilingual story time is simple enough for families with no previous knowledge of French and familiar and new songs with handouts – including song lyrics and their English translations – provided. It’s a great way to introduce young children to French language learning prior to elementary school and is ideal for families considering enrolling their children in French immersion. The program is suitable for all ages and is ideal for ages 3-5. “Family Fun With French” runs every Thursday morning at 10:30 am at Central. For more information call Kate at 519-255-6770 x. 4434.